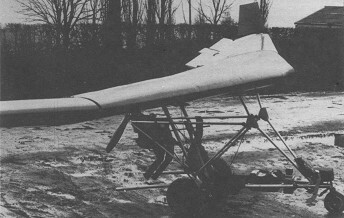 Single-seat single-engined high-wing monoplane with conventional three-axis control. Wing has swept back leading edge, unswept trailing edge and tapering chord; no tail. Pitch/roll control by stabilator; yaw control by tip rudders; control inputs through stick for pitch/roll and pedals for yaw. No external wing bracing; wing profile 100% double-surface. Undercarriage has three wheels in tricycle formation; no suspension on any wheels. Flush-right go-right nosewheel steering connected to yaw control. No brakes. Aluminium-tube framework, without pod. Engine mounted below wing driving pusher propeller. All tubing and bolts are to aircraft specification. Dave Bremner's home-built special uses a standard Mitchell B10 wing, the rest of the aircraft being to his own design. Certainly the most unusual aspect of the aircraft is its engine, a Suzuki twin from the GT185 motorcycle. Originally the aircraft was fitted with a 210 cc Villiers kart engine, but this suffered from two disadvantages: first it was difficult to arrange a suitable engine mounting system, and second it could only be started by swinging the prop. Dave's search for a replacement led him to the GT185, which he chose because it has integral electric start and a horizontally split crankcase, allowing the gearbox to be removed without expensive machining. In most respects he has built a fairly conventional machine, the cage being based on photographs and sketches of Mitchell's own. There is no braking or suspension and the pedals are arranged so that both tip rudders can be deployed simultaneously to provide air braking. There were no plans to market the aircraft. Engine: Suzuki GT 185, 20 hp at 6800 rpm. Propeller diameter and pitch 50 x 27 inch, 1. 28 x 0. 70 m.
Max static thrust 90 1b, 41 kg. Power per unit area 0.15 hp/sq.ft, 1.6 hp/sq.m. Fuel capacity 2.4 US gal, 2.0 Imp gal, 9.1 litre. Chord at root 5.0ft, 1.52m. Chord at tip 1.3ft, 0.40m.